If Milwaukie's baseball team learned anything from Wednesday's season-opening 7-3 loss to Redmond, it was this: Stay positive. Redmond's Hardy Hinton went 2 for 4 with a key two-out, two-run single in the fifth inning that helped the Panthers spoil the Mustangs' first game at the newly-renovated Lake Road Sports Complex. Milwaukie brought the tying run to the plate in the seventh inning, but the game ended when Redmond reliever Austin Carter retired Mustangs' leadoff hitter Logan Killian on a fly out to center field. "We did pretty well for this early in the season," Mustangs senior Kaden Middleton said. "In the seventh, we rallied back a little bit, but we need to have the kind of pace at the beginning of the game rather than trying to start it toward the end. "We had people on base, but we just didn't produce at the plate when we had our chances. We just need to keep working on it." Milwaukie graduated nine seniors, including seven starters, off last season's 5-18 team, so the Mustangs may have more retooling to do than most of the other teams in the 5A Northwest Oregon Conference. The good news is they have 18 players who saw action last summer in the OIBA Futures League, not to mention the new $2-million, all-weather turf fields at the Lake Road facility that will allow the Mustangs to get outside on days that used to push them indoors. "We really should have any down days where we have to go into the gym," Mustangs coach Bud Taylor said. "We were outside for three snow days a few weeks ago, so we're going to play out there and practice out here all year long, which should accelerate our development dramatically. "I think, honestly, player to player, position to position, we're probably stronger this year with younger players than we were last year." Do the Mustangs have the pieces to make a serious run at one of the NWOC's four berths into the state playoffs? "I believe we have a shot," senior catcher Jonah Waage said. "We've got a lot of young guys who are really eager to play and they're competing with the upperclassmen for playing time which has everyone working hard. All that helps us grow into a better team." Senior pitcher Jacob Delamater seconded that opinion. "I definitely think our program has changed for the better this year," Delamater said. "We have better team chemistry than we've had in the past and if we can just keep our heads in the game, that's really going to help us." Middleton, the senior right-hander, drew the start on the mound against Redmond with Waage behind the plate, senior Oskar Hutchison at first base, junior Gage Cory at second, sophomore Hunter Entrikin at third, junior Nick Cooper at shortstop, sophomore Dustin Hyatt in left field, junior Peter Foulke in right, and Killian, a sophomore, in center. Redmond scored three runs in the first inning, two in the fifth, and two in the two in the sixth to take a 7-0 lead. Milwaukie left two runners stranded in the first inning, two more in the second, one in the third, and then squandered another scoring opportunity in the fourth when the Mustangs had the bases loaded with one out and came away empty. "Our mood definitely changed," Delamater said. "We were really excited to start the game and then a couple of bad things happened and we got in our heads a little bit." In the seventh, Middleton reached on a one-out single, Foulke got hit by a pitch, and Hutchison drew a walk to load the bases. Middleton then scored on a passed ball, Foulke scored on a sacrifice fly by Cory, and Hutchison came home of Delamater's two-out single to center. Middleton went 3 for 4 at the plate to lead the Mustangs' seven-hit attack, and he also pitched the first five innings, allowing five runs on four hits with two walks and eight strikeouts. Delamater worked the last two innings, surrendering two runs on three hits with one strikeout. "I felt I did alright," Middleton said. "I would have liked to have changed a couple of things and put the ball in different places that could have changed some of those runs. "We have the guys to be a league contender. I feel like we all want to be here, we all want to play, and we're playing as a team, which feels good. We've just got to play with enthusiasm and have everybody playing their hardest all seven innings." Said Taylor: "I told my guys that tomorrow's another day against South Albany and, hopefully, we'll go down there and play a little bit better, be a little more aggressive with the bats, and pick one up down there. "We're excited. There's a lot to be excited about here at Milwaukie, especially with our new turf field up here. And we should be competitive and, hopefully, make it into the state playoffs. That's our goal." 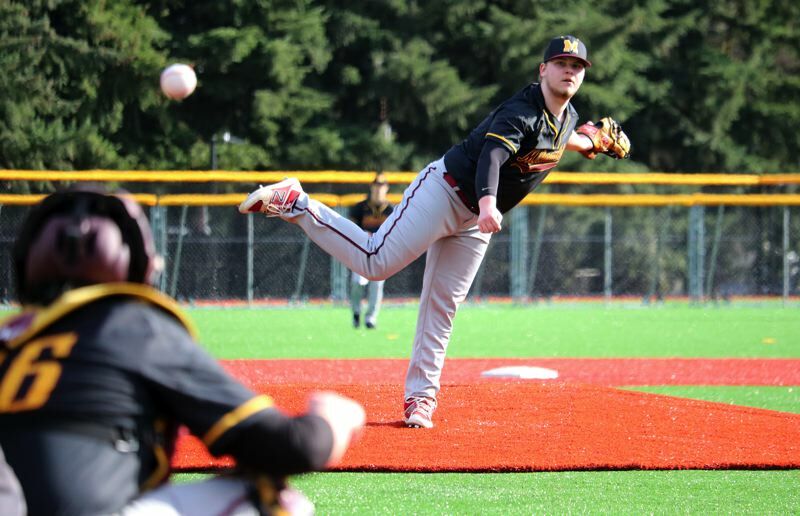 MILWAUKIE 7, SOUTH ALBANY 1: Gage Cory's two-run single capped a six-run fourth inning that helped the Mustangs to a road win Thursday over the RedHawks. Trailing 1-0, Milwaukie sent 10 batters to the plate in the fourth inning and scored six runs on five hits, one walk, and one South Albany error.